A cultivar (Grevillea leiophylla x Grevillea humilis subsi. 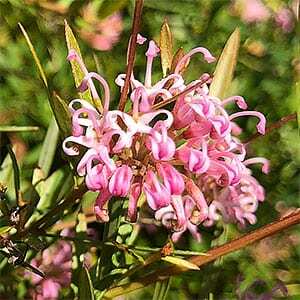 maritima) Grevillea ‘Pink Midget’ is a dwarf variety. It is long flowering, with small pink to mauve spidery flowers, excellent in the garden border and this is one Grevillea that can easily be grown in pots and containers. This is an easy care Grevillea and will tolerate a range of soils except for waterlogged types. It will grow in full sun to part shade, flowering can be limited in deep shade. Common Name – Grevillea ‘Pink Midget’. Soil – Well drained loam to sandy loam. Well drained clay. Climate – Warm Temperate to Cool. Flower colour – Pink to mauve.